Check for snakes in the ‘gulp’ bathtub!!! A friend of mine from West Point just called to tell me the most hair raising story I’ve ever heard. My hair would have turned white if I hadn’t just gotten it colored for my class reunion. It would be unbelievable if he weren’t so reliable. I even called his wife, Lucille, at her office to double check the facts. Two weeks ago, Norman Armstrong came home about 4 p.m. to discover a snake in his bathtub. 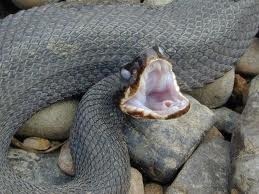 A cottonmouth no less! Acting on adrenalin, he took his walking cane, stepped on the snake’s head and beat the thing to death. Only later did he begin shaking as he considered the gravity of the situation. 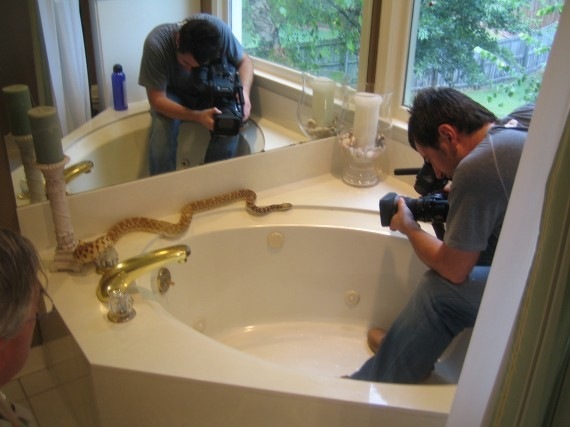 What if it had slithered out of the tub into the house? What if – I don’t even know what to ask what if!! He now has a stopper in the drain. But with the weather so hot and dry, you may want check any plumbing openings to where-ever plumbing openings lead. I choose not to think about it too much. I live in an old house and betcha a dollar I have pipes which could be invaded. On a side note, my friend, Kate Roberts from Columbus, discovered a snake in her house several years ago. She called an exterminator and they never found it. As she was telling me the story, I involuntarily lifted my legs and propped them on her chair. On April 16, 2010 the Associated Press reported that a woman found a python in the toilet of her La Vista, NB hotel room. Officials with the Nebraska Humane Society were called and estimated that the python was about three years old. They suspected that the python was a pet, since pythons that old are not typically found in the wild, especially in Nebraska. Though it doesn’t happen often, snakes do come up through the sewer pipes and appear in the toilet or tub every year. This one was a little too close to home. This entry was posted in General Stuff and tagged snake in the house! Cottonmouth in the house, Watch for snakes in the tub by Emily Jones. Bookmark the permalink. my feet are up in my chair right now ! How about this fellow…A friend of my son killed it at the hunting camp in Brewton, Al. over 8 feet long, more than 100#, 22 rattler’s and a button…LOOK at that HEAD ! I have a friend who found a snake in a commode in her country home. Every time she and her husband would try to catch the snake to get it out, the snake would slither back down into the pipes. They finally got rid of it by pouring several gallons of clorox into the commode. But I don’t think she has used that commode since!!! This week I heard that a family found a baby opossum under the covers of their bed. This family lives on South Montgomery!! I don’t think I will be sleeping tonight! Remember the snake getting in my house last summer? I stepped on a large garter snake in SoDak this summer and didn’t go on a walk again! Think I’ll go stop up all my drains! Oh Lota, forgot about your snake story last year. How did it get into the house? I’m so paranoid, I’ve put bricks on the toilet seats and in all the drains. Got into the garage and came right under the door into the house. Someone told me that if a snake wants in, it will get in. Creepy! My lake home may be for sale!! !You all are scaring me! I’ll buy it, Norma, snakes and all! Will you toss Bubba into the deal? Saw your comments through Carolyn’s blog. an agent I know found a rattler in her garage. said the kids had heard it for several days and thought it was a water sprinkler. she killed it, then discovered another on the driveway the next day. so your friend needs to check as snakes tend to come in pairs. Noah knows all about that.